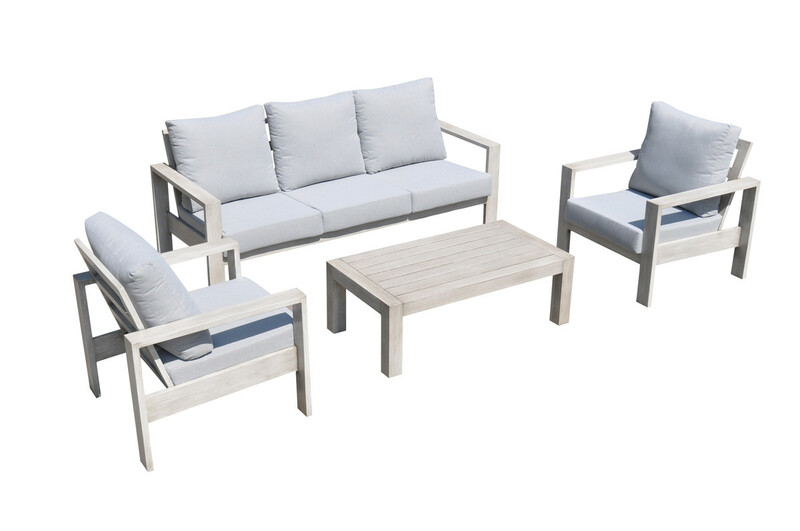 Introducing our new Renava Palms outdoor sofa set. Time to let your outdoors shine in fun summer colors. 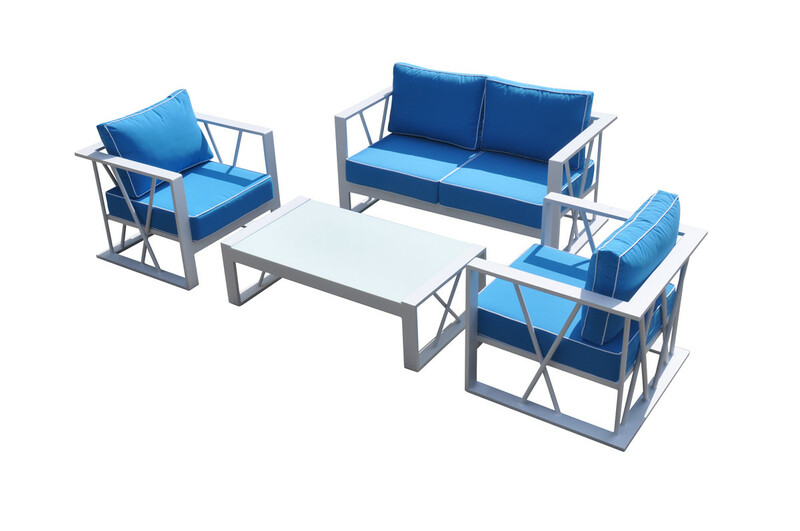 The set comes upholstered in a relaxing blue color with white piping. The fabric is made from waterproof polyester, the aluminum frame is coated in white powder. This modern style set has a crisscrossing frame that makes it stand out. It includes a loveseat, 2 chairs, and a coffee table. The coffee table has a tempered glass top with a white powder frame. 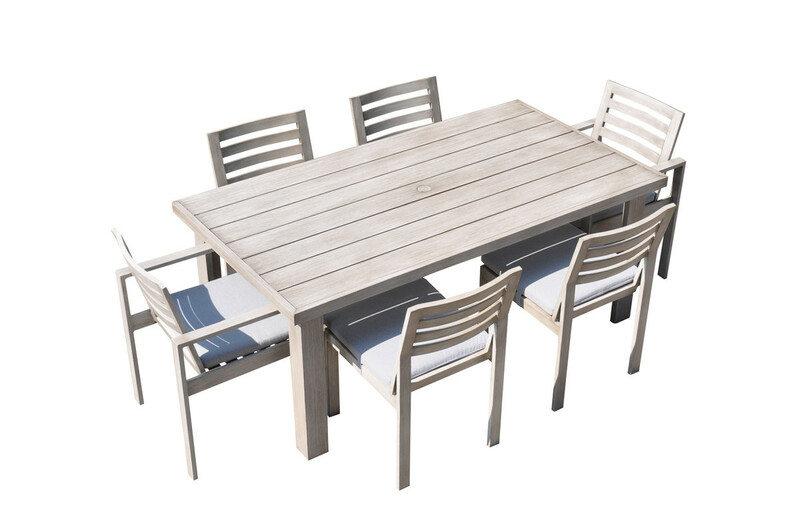 This stylish set is the perfect match for your outdoors this summer, it is comfortable and does not require assembly. 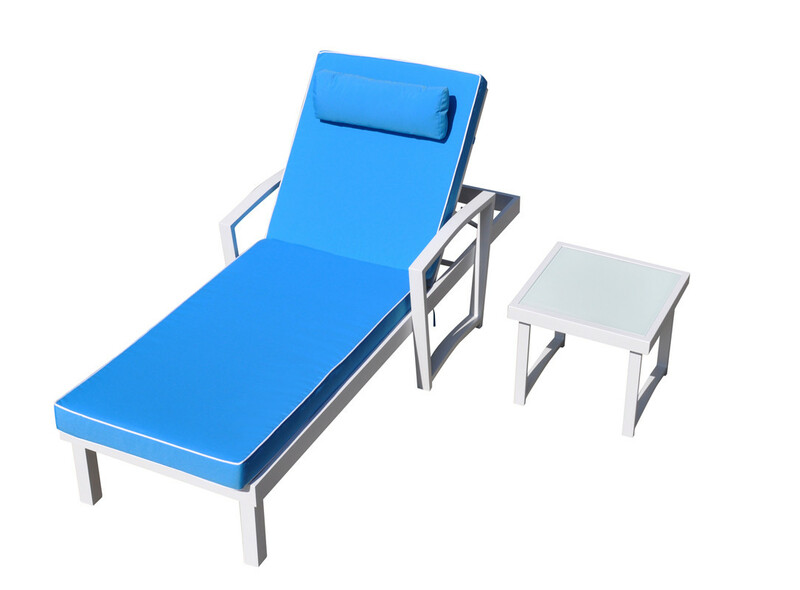 Get the complete look by including the Tampa outdoor sunbed and end table. The sunbed and end table are made of the same materials as the sofa set. It includes an adjustable backrest and requires some assembly. Summer has never looked so fresh. Summer doesn’t always have to be about bright colors; if you’re more of a neutral color person, the Dunes outdoor sofa set is meant for you. This sofa set is made from aluminium frame with a wood, hand brushed finish. The fabric comes in grey, it is waterproof and includes thick cushions. It includes a sofa, 2 chairs, and a coffee table. It is the perfect set for customers who like a more cleaner and cooler setting. The Dunes sofa set has a matching dining set. It has the same aluminium frame with a wood, hand brushed finish. Grey waterproof fabric cushions and includes an umbrella hole. The sets includes a dining table, 2 arm chairs, and 4 side chairs. These two sets are very welcoming and modern. Your fun in the sun awaits, what is your preference; Neutral or a pop of color?